Living in survival mode is quite different than everyday life. 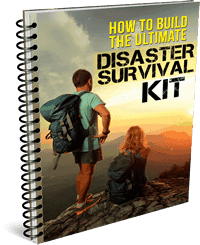 I’ve run across many people who have thought that they were prepared for surviving a catastrophe, even though they hadn’t done anything to survive. Usually, these are highly capable people who are used to doing a lot of things for themselves. Many have extensive workshops, where they fix whatever their family needs. Yet that doesn’t make them ready to survive. Most of those workshops have the wrong types of tools to survive. Besides, what good are a bunch of power tools going to do if there is no electricity to operate them? Did you buy that easy to use electric chainsaw? The tools it takes to survive in a crisis are much different than the tools we use on a regular day. 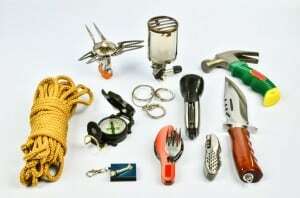 Survival tools can be broken down into two basic categories: those that are used at home and portable tools to be used when bugging out. You need to prepare both types as you don’t know what you’re going to face until the time comes. Following is a list of Survival Tips for your well being. A Good Knife. The knife tops the list of Survival Tips because it is the most universal tool; it can be used for everything from food capture and preparation to shelter building and maintenance. To be a good survival knife, it should be a full-tang, fixed blade. A long blade looks flashy but isn’t really necessary as it can be hard to work with. A knife that is four to five inches long is plenty. An Ax. If you lose power, there’s a good chance that you’re going to need to cut firewood to heat your home. An ax or maul will make it possible to split the logs you cut so that they will burn well. A Bow Saw. A chainsaw is commonly used for cutting logs. But if gasoline is not available, that is not going to do much good. While a bow saw is much slower for cutting tree branches and logs, it will work as long as you have energy in your body. A Crosscut Saw. Many types of disasters can cause damage to our homes. Being able to make repairs can be the difference between being able to stay in your home or having to leave. Once again, this is another area where power tools dominate, but before all those nice power saws came along, the crosscut saw was the choice way to cut lumber. A Shovel. A shovel will allow you to break up the ground to plant seeds for a garden or dig a hole to be used as a latrine. Both of those can be very important if normal services are down. A Wheelbarrow. This universal hand cart can be used to haul water from the local pond, or to maintain a garden. When there’s no gas for the car, you’ll still need water and other supplies, and that wheelbarrow could be a lifesaver. A Butane Lighter. We don’t normally think of a cigarette lighter as a tool, however it makes the Survival Tips List because it will come in handy in survival mode. Lighters are much better than matches for starting fires simply because they stay lit and won’t be as affected by bad weather. Keep it up close to your body when outdoors so the wind does not blow it out and waste your fuel. A Gun. Careful here!This is another one that most people don’t think of as a tool, but that’s exactly what guns are. With them you can hunt for food, protect your home, and signal for help. Be sure to practice with your guns so that you can use them well. Also be sure to get proper training! Sometimes I get a little queasy by putting this on a Survival Tip List, however there is a chance that this “tool” will be needed, and it would be a disservice to you and this site not to mention it. A Hatchet. Your ax is for cutting wood at home, whereas a hatchet is best for your bug-out bag. While it won’t cut wood as well as a full-sized ax, it’s a lot easier to carry and is definitely better than not having one at all. Your hatchet should also be useful as a hammer for driving tent pegs. A Wire Saw. That bow saw is a bit big to fit in your backpack. If you have to bug out, having a wire saw will give you something to use for cutting tree branches to make shelter. Buy the three-wire kind; that way, you’ll still have a saw if one strand breaks. A Camp Shovel. Another portable version of your home tool. You might have to dig a hole in the woods for a fire pit, put a trench around your tent to drain water, or dig a latrine to bury waste. While a folding camp shovel isn’t as good as full-size, it’s a whole lot better than using your knife or bare hands. A Honing Stone. That knife you’ve got, which you can use both at home and in the woods, isn’t going to be very useful if it doesn’t have a sharp edge on it. Always keep a honing stone and some oil so that you can keep your blade in top form. Good tools and the knowledge of how to use them can mean the difference between life and death. There are two keys to success. First, buy quality tools. This isn’t the place to get cheap because poorly made tools will break at the worst possible times. Second, know how to use what you have to full effect. Even if you buy the best axe on the market, if you don’t know how to split a log with it, you’re going to be cold out there in the wild. Practice with your tools until you are comfortable with them. Then, when you have to use them, you’ll be ready to solve problems speedily and with a whole lot less stress.